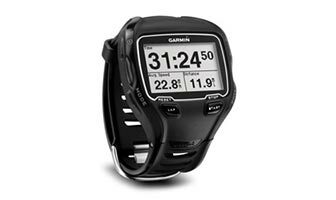 Advanced GPS-enabled watch for multisport athletes, ultra runners and water sport enthusiasts. The “ordinary people” in Trailrunning Team Vibram® 2014, selected the GARMIN® Forerunner 910XT model for their "extraordinary" experience. Tracks time, distance, pace, elevation (via barometric altimeter) and heart rate on land.